With pet battles as a tie-breaker. 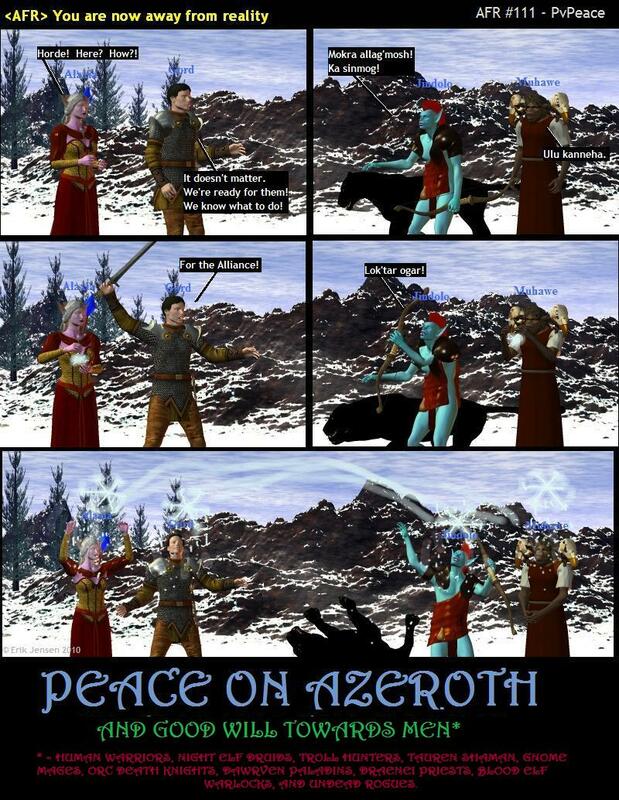 Get your WoW comics fix at the Sunday Morning Funnies tumblr! Well, what else are you going to do when you need wool and you can turn people into sheep? This one’s for everyone out there who’s been trying for School of Hard Knocks only to be frustrated by other players on your own side of the battleground. – It encourages cooperation with the opposing team and competition against your own side. – It gives people an incentive to be selfish and a disincentive to play as a team. – It makes people focus on short-term goals that may not be the most useful thing in the battleground at that moment. – It depends much more on luck than on skill. – It gives griefers a whole new way to grief for a week. – It annoys pvp-ers by flooding the battlegrounds with people who don’t want to be there, aren’t interested in playing the game, and have no incentive to follow the customs and rules of the battleground. – It annoys non-pvp-ers by introducing them to the pvp aspects of the game in a way that is frustrating, aggravating, exposes them to the scorn and anger of experienced pvp plaers, and will probably convince them to never come back. World of Warcraft is a game, an entertainment. The point of entertainment is to make people happy. Now, sometimes making people happy in the long run requires making them unhappy in the short term. That’s something we all understand. Return of the Jedi is such a great movie not just because our heroes triumph but because they triumph after coming back from so far behind in The Empire Strikes Back. If Empire had ended with Han safe and sound, Vader defeated, Bobba Fett dismembered, and Luke calmly staring down the Emperor, Jedi would have been a very dull movie. Giving people what they want with no struggle or cost is bad entertainment. On the other hand, just making people unhappy so they can be relieved when it’s over is not good entertainment either. Hitting someone in the face with a brick because it feels so good when you stop is not a fun game. There has to be some balance between the pain and the payoff. So, which is School of Hard Knocks– The Empire Strikes Back or a brick in the face? For the answer, I think we can look to all the online discussion of the achievement. From my unscientific perusal, there seems to be about a 90/10 split: 90% of people hate the achievement and just want to be rid of it, while 10% like it. That’s 90% of people made miserable, which is a pretty hefty downside, but if the other 10% are really made happy by it, there might be a case in favor of the achievement. So, are they? Not from what I can tell. In every place where I’ve looked– official discussion boards, blog posts, independent sites– everyone who has a positive opinion of School of Hard Knocks says essentially the same thing. To paraphrase: “omg lol SoHK iz teh bestest achive ev4r cause im such a l33t pvp g0d go qq n l2pvp u newbzorz!!! !1!” Smug is no substitute for happy, and if the only pleasure people find in an achievement is gloating over the misery of others, I don’t think it’s worth it. So, for those of you keeping score at home, that’s 90% of the player base who think School of Hard Knocks is like getting hit in the face with a brick, and 10% who think it’s like watching someone else get hit in the face with a brick. I really hope you’re listening, Blizzard– it’s time to chuck this brick out the window and come up with a better, more Empire-like achievement for Children’s Week. 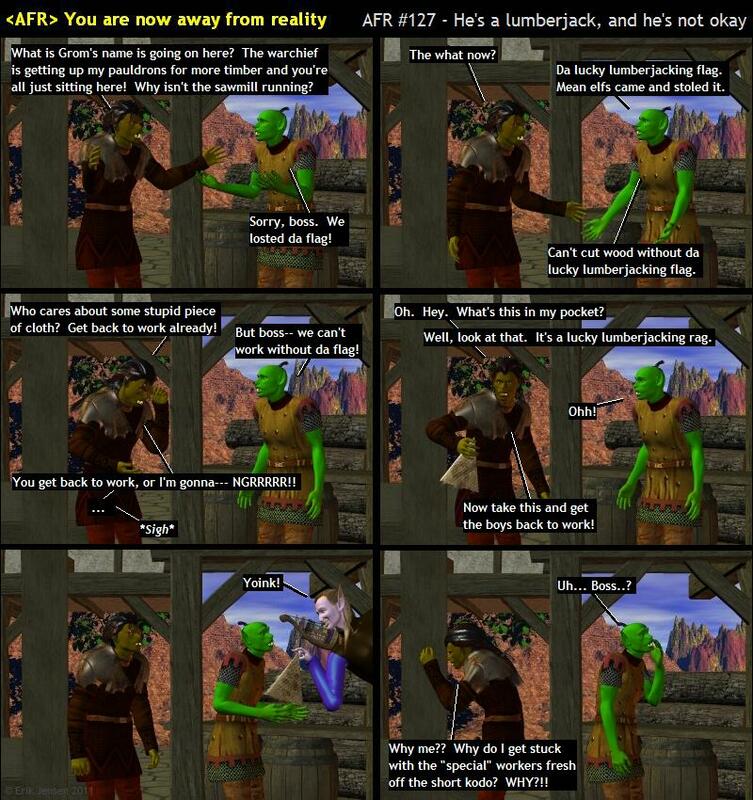 Just in case you’ve been wondering why exactly the night elves and the orcs are doing battle over a valley by swiping each other’s flags.